Unless it’s attached to the words “under par,” seven is the last number you want emblazoned on your golf scorecard. That’s unless you are Desert Mountain’s Bill Brownlee or Wendell Pickett, and this number not only places you in the company of Jack Nicklaus, it’s also linked to the future of golf. Over the past decade golf’s traditions, participants, and bottom line have all taken a bruising. 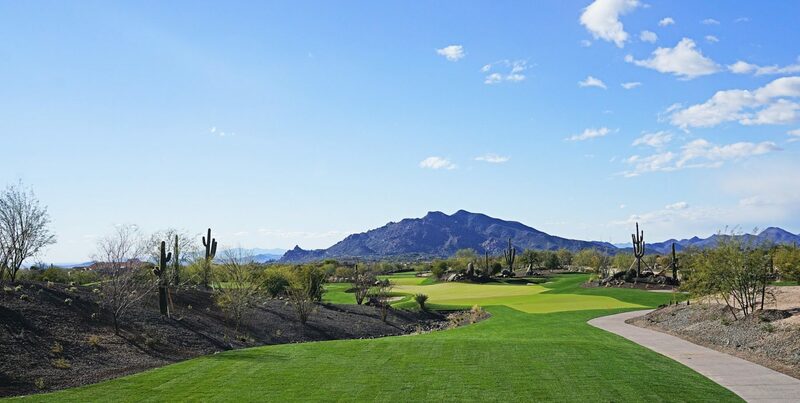 When the Desert Mountain Golf Community in Scottsdale, AZ, decided to develop the last remaining parcel on its 8,000 scenic acres in the Sonoran Desert, the members decided to split from the past and go bold. 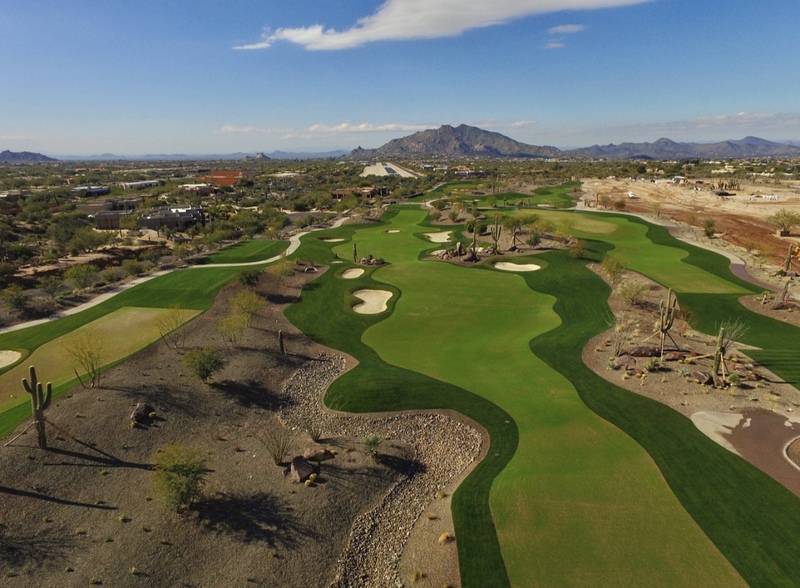 To understand how a big of a leap the new Seven Golf Course is, you must grasp Desert Mountain’s proud legacy leading to Seven’s opening in April 2019. 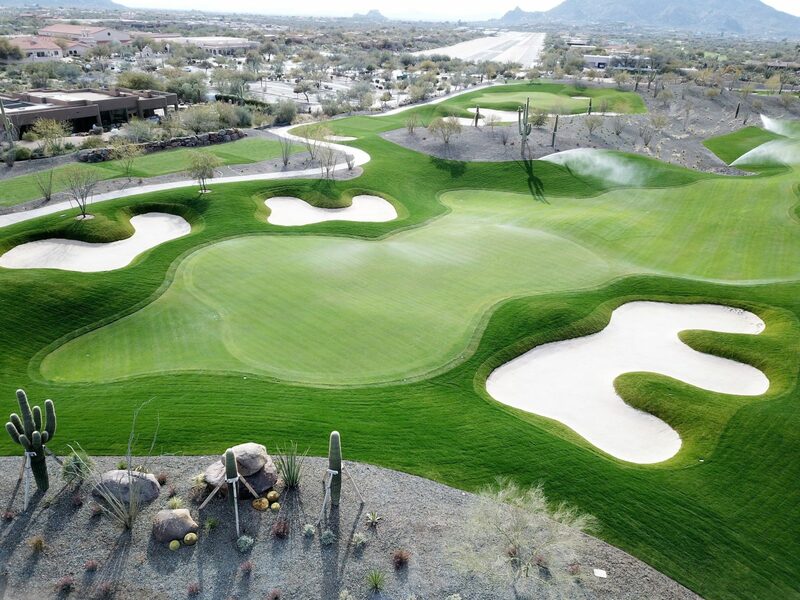 Desert Mountain’s first six 18-hole courses were all designed by Jack Nicklaus. What would the aptly named Seven Golf Course do for an encore? Brownlee and Pickett decided to break from golf’s 18-hole norm and design a Par 54 golf course. If you do the math, that means each hole on the new Seven is a Par 3. 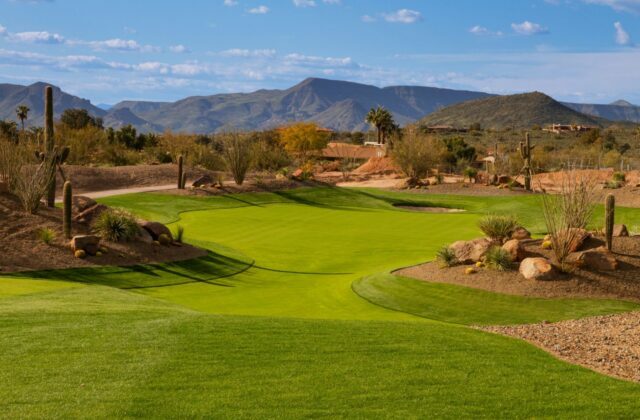 The forward-thinking Brownlee and Pickett had already established a track record with this concept in Wickenburg, AZ, and they decided that taking par 54 golf to the next level at Seven was just what the Desert Mountain members were looking for. “You hear repeatedly that investing four to six hours playing 18 holes of golf is too long. There are whispers and even shouts that golf courses are too hard. At Desert Mountain we are proud to feature six award-winning golf courses that are as beautiful as they are challenging. Seven is spectacular from an aesthetic standpoint, but it’s also a golf experience that’s just over 3,100-yards. Golfers choose from three tee boxes, and your total time investment should be three hours or less,” Brownlee said. The wild card infused into Seven is fun. The extras that golfers can anticipate before, during, and after their round is nothing short of groundbreaking. 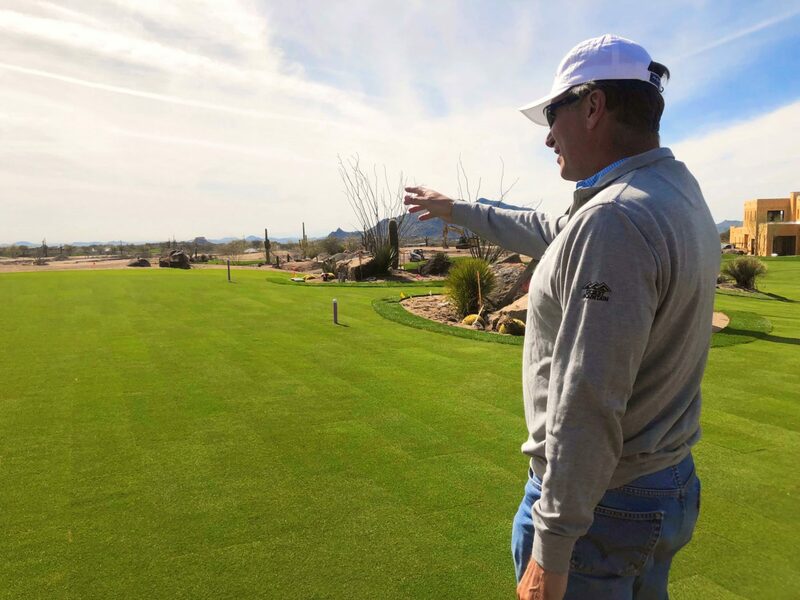 “Our 9,000-square-foot clubhouse is going to be a new epicenter for social activity here at Desert Mountain. Our restaurant will provide gastropub offerings and craft beers. Guests on our patio will enjoy an elevated view of the Sonoran mountains, epic sunsets, and golfers putting out on 18. We’ll also have music, bocce ball courts, fire pits, and putting contests on our massive lighted practice green,” Brownlee said. Since 1986, golf has been the main drawing card for residents at the luxurious Desert Mountain. As members themselves, Brownlee and Pickett knew that a golf course which didn’t adhere to the championship quality standards set by Nicklaus wouldn’t wash. These quality legacies were instilled in the Seven construction team as they moved dirt, carved sand traps, installed a new Rainbird irrigation system, and planted a special turf element to the whole agronomy mix. “We feature bent grass from the tee boxes to the greens. The idea was to create a striking tee to green feel that appears to be one continuous surface. Ultimately our goal is to welcome the newcomer, re-introduce golf to someone who may have turned away from the game, and provide a challenge for the lowest handicapper,” Brownlee said. The story behind the name isn’t as logical as you’d think. The Desert Mountain team tossed at least 65 names in the air before choosing Seven. “When Seven was first discussed, there were a lot of blank stares. After several more meetings we came back to a name that is not only easy to remember, but one that makes sense when you consider there were six courses that came before. Having seven courses in our master planned community is a gamer changer,” Brownlee said. The last design task on Seven was to stretch two of the Par 3’s to at least 250 yards and be over 3,000-yards total. These changes were made to conform with USGA rules and to register a course handicap rating. Brownlee also reminds that a 270-yard Par 3 from the tips can be modified by playing from two shorter tee boxes. Whew! Brownlee was asked what it was like to follow six Jack Nicklaus signature courses with a design of his own at Desert Mountain? “No one can top Jack. He’s a legend. Wendell and I are thrilled to build Seven on the same 8,000-acres as Jack’s wonderful courses. The opening of Seven means one more choice for golfers who come to experience Desert Mountain,” Brownlee said.